Title: Sister Princess - Brother, Where Art Thou? Tokyo… or no? Be careful what you wish for! After a year of living on Promised Island with thirteen girls, Wataru gets a visitor from Tokyo who brings him some really startling news. Now Wataru is faced with a difficult decision that will affect him, and all of his sisters as well. In this last exciting volume of Sister Princess, all the secrets will be revealed, and everyone’s lives will be changed forever! Sister Princess: Brother Where Art Thou? 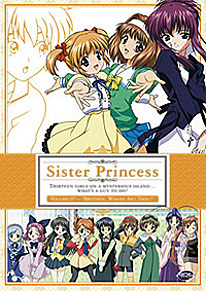 (SRP $29.98 DVD) is a DVD-only release including episodes 24 - 26, presented in both English 5.1 and Japanese 2.0 with English subtitles. Extras include a behind-the-scenes “Best of the Series” review, plus clean opening animation, clean closing animation, and previews of upcoming ADV Films releases.